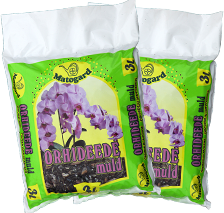 This composition assures a good drainage, fluffiness and favourable air regime for orchid soil. Replant orchids after every two or three years. The best time for that is at the end of the vegetation period. Extra care should be taken when replanting orchids, so that their fragile roots would not become damaged. Orchids are properly watered a day before replanting in order to facilitate the detachment of roots that are stuck to the pot. Dead and decomposed roots and stem bulbs are removed. The bottom of the pot is filled with a drainage layer, which is up to 1/4 of the depth of the pot (pot chips, light gravel, etc). The drainage layer is covered with substrate layer, on which the plant is fitted in a way that the root neck or the rhizome would remain almost as high as the edge of the pot. The gaps between roots are filled with substrate. Try not to compress the soil during planting. It is important that the plant is solidly fixed to the substrate (support stick). It is not recommended to water the plants only until 3–5 days after planting. Water the plants properly in spring and summer and moderately in autumn and winter. If possible, use soft water for watering. During active growth period, fertilize orchids with weak fertilizer solution. Orchids need plenty of light, but not direct and strong sunlight. Avoid draughts. Provide sufficient air humidity, sprinkle the plants from time to time.